If you are new to the gluten-free lifestyle, the holidays may seem rather daunting. However, this time of year can be joyful in the kitchen for you as well. You don't have to pass up on all desserts. If you have a favorite all-purpose gluten-free flour blend, you can very often substitute one-for-one by replacing all-purpose wheat flour, with your gluten-free mix. For some recipes you will need to add a little xanthan gum for texture, but that's about it. 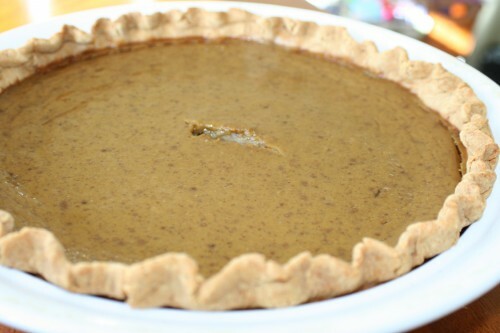 And, if you love pie, I'm here to share my favorite pie crust recipe. I've posted this before, but thought now would be a great time to remind you how possible it is to live gluten-free. This recipe is quite simple and freezes well, if you want make several batches to have on hand. I've served this to gluten eaters and they don't notice a difference. So, go ahead, eat a piece of pie this holiday season! In the bowl of an electric mixer, mix together the flours, sugar, xanthan gum and salt. Add the butter and mix until the mixture is crumbly and resembles a coarse meal. Add the egg and orange juice. Mix on low speed until the dough holds together; it should not be sticky. Form the dough into a ball using your hands and place on a sheet of wax paper. Top with a second sheet of wax paper and flatten the dough into a 1-inch thickness. Roll out the dough (if it seems tacky, refrigerate for 15 minutes). Remove top wax paper and invert into 9-inch pie pan. Remove second sheet of wax paper and crimp the edges. Fill with desired filling. Makes 1 9-inch pie crust. *Brown Rice Flour Mix: 2 c. Brown rice flour; 2/3 c. Potato starch (not potato flour! ); 1/3 c. Tapioca flour. Perfect, this is just what I've been looking for!